We just received another shipment of King of Fighters 2001. Brand new and original with poster. Players may choose from 40 fighters, including 4 new faces and the return of 3 popular characters. Players also now have the option of no strikers on the team or up to 3 strikers at one time, meaning 1 fighter on the screen and all other members of the team as tactical support. The mechanics for calling in strikers have also been altered, so players can call strikers only under certain circumstances such as opponent on the ground, 1 power stock available. 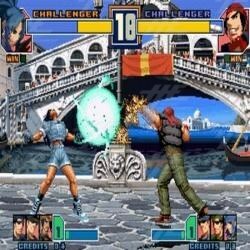 KOF 2001 also sees the introduction of the "Wire Whip" which allows a fighter to hit an opponent against the side of the screen and boomerang back, so the fighter can add a follow-up attack and cause untold damage to the hapless opponent.